Excellent for enhancing the general circulation of the blood and warming the extremities. Increases resistance to damaging environmental factors and illnesses, and increases overall vitality. Indicated as a circulation stimulant helpful in treating poor circulation (particularly in the extremities), chilblains, and cramps. Also enhances brain and cerebral circulation and acts on a wide range of vascular conditions. OS-9 comes in 1 oz. (30ml). Using 30 drops per day this bottle will last about 1 month. 10 to 20 drops in water, two to four times a day. Best taken upon rising and between meals. Do not take with fever or active inflammation. Do not take if inflammatory venous conditions associated with burning, redness and pain are present. 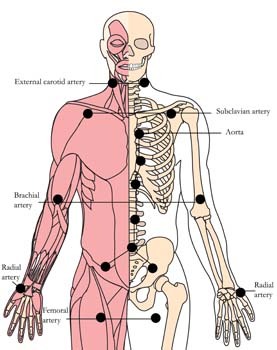 Location: Cell Point A is located below the base of the skull, in the hollows of each side of the spine. Benefits: Relieves tension in the shoulders and neck. 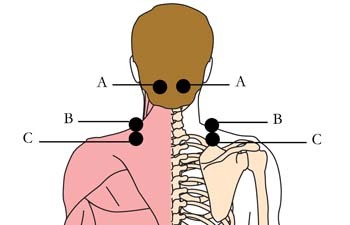 Location: Cell Point B is located on the highest point of the shoulder, one or two inches out from the neck, on the tightest spot. Benefits: Relieves stiff neck, shoulder tension and poor circulation. Location: Cell Point C is located on the shoulders, one-half inch below the top of the shoulders. Benefits: Relieves muscular tension, stiff neck and shoulder pain. Application:Liberally apply Panther Juice to the area and allow to dry completely. Adhere Micro-Disks with Cell-Dotts™. Duration: Start Cell Point application when you begin using OS-9. Continue wearing the Micro-Disks for two or three days symptoms have cleared. Reapply at the first sign of imbalance. Typical Balance Session: Using your TLC Bars, charge each point for 30 seconds in. Reverse the flow for 30 seconds. Finish with 30 seconds in.